This round of Fameshed Reign has switched it up a little!!! We have the Laced Oxfords available, however they come as a fully customizable pack, and there are LOADDDSSS OF OPTIONS. Please note that currently there is a body update pending from the Belleza Body Creator for the Freya Flat feet..
A while back we were approached by the owner of Grixdale about a shoe to go along with the BlueberryxGrixdale Epiphany Harley Quinn themed gacha and I’m so happy to finally say they are done!!! Each color option comes with a control hud for customization. Accent colors, leather style options, lace colors ect. 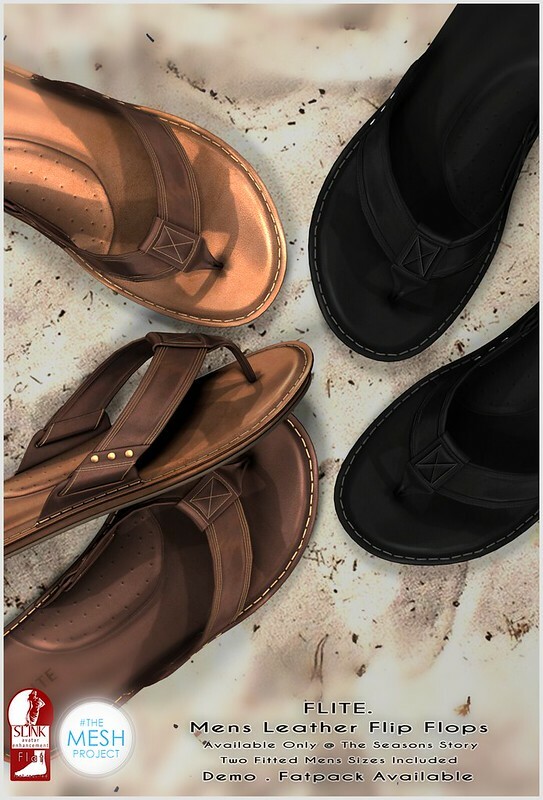 You can get them at N21 until the 12th of May and the mainstore after. This week for the Saturday Sale Reign. is Debuting the Carrie Plats. 6 Color options to choose from. 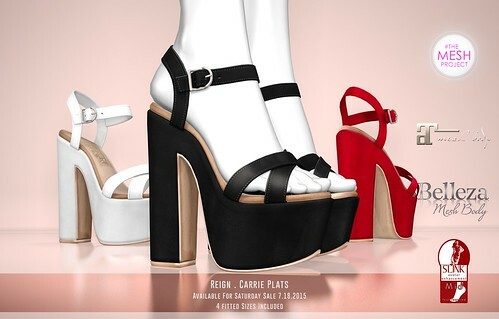 Each Color Comes in Belleza, Slink, Maitreya, and TMP Mid Foot Sizes. Get yours while they are on sale!! 75L for the Saturday Sale. Demo Available. REIGN.- @ EPIPHANY GACHA EVENT! A NEW GACHA EVENT HAS HIT THE GRID!!! The Epiphany Gacha event opens at 12am Slt On the 17th!! 1. You play your chosen gacha machines as many times as you want. 2. When you rez the item you will get the option via a on screen Pop Up to either turn in for points (REDEEM), or keep (KEEP) the item. -The Redeem Option gives the owner the opportunity to trade that item in for Epiphany Points, Which they can then save for exclusive prize items created by the designers of the event. (Common items are worth 1 point, and Rare items are worth 3 Points). Once an item has been redeemed for points it will be deleted from your inventory. This option saves you the headache of normal gacha duplicates or yardsales… Plus you can grab some great prizes with the points earned. -The Keep Option allows the owner to either use or trade/give away/ sell the item as normal. KEEP IN MIND THAT ONCE REZZED YOU HAVE ONLY 30 Seconds TO DECIDE IF YOU WANT TO KEEP OR REDEEM THE ITEM FOR POINTS. AND YOU ONLY GET TO CHOOSE ONCE SO KNOW WHAT YOU WANT TO DO WITH THE ITEM BEFORE YOU REZZ IT TO THE GROUND. Ok now to The part of this long post you have all been waiting for!!! 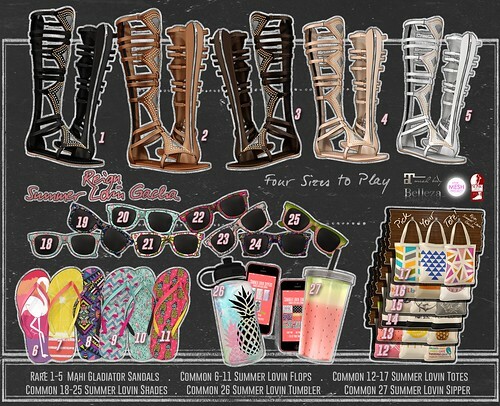 the REIGN.- Summer Lovin Gacha! -Summer Lovin Tumbler(ANIMATED)- Hud Has 3 Straw Colors and 8 Different Cup Options. The Wayward Carnival Event Opened on 7/15!! The Charisma Heels were Debuted there. 6 Colors to choose from, Each Pair includes Sizes for Belleza, Slink, Maitreya High feet and TMP Ouch Feet. Click Here to go to the event > TP! For a Complete Look at the Wayward Carnival Event Gallery Visit ELOQUENCE SL. THE SEASONS STORY SUMMER ROUND!! The Season Story Opens Tomorrow (7/10)!!! Reign and Flite are both taking part in this round. -The Reign Hanna Wedges Are Made for Slink, Belleza, Maitreya, and TMP Mid Foot sizes. Demo and Fatpack available. 5 Colors to choose from. Mix is a brand new event that is hud based shopping. The items for the event are set up in the mainstores and you tp to each to grab the items. A hud will be available via the sign located next to the Reign Item in the mainstore. 11 Colors to choose from, Fatpack and Demo available. July 1st Fameshed Opens at Midnight, and The Reign. Adele heels will be available!! These heels come in 7 Different color options each including a Metals hud with 5 metal colors. We are now accepting Requests for Updates of currently released shoes. Please see the drop down menu for Reign and Select Update Request to fill out the form.